A team of scientists and art historians announced today how they used statistical analysis, deep learning algorithms, and 3D printers to create an image that is intended to look like a typical Rembrandt. Pretty sad attempt. According to science, bumble bees can't fly. In my view they have captured something from the works of the early Rembrandt, kind of a "reproductive cloning". I'm wondering what will come out when they attempt the reproduction of the late Rembrandt, with his acquired freedom of handling & texture. This is not "Deep Blue" beating Gari Kasparov in chess, nor the Go-world-champion succumbing to the latest achievement in computer Technology: This is different, I would say. Looks rather bland - like a mishmash of Rembrandt's early portraits of the 'Anatomy Lesson of Dr. Nicolaes Tulp' period. Not much in terms of texture or interesting lighting, and certainly not representative of what Rembrandt is most famous for. Stanislaw Lem described in one of his SF works a computer model that took the body of work by Dostoyevsky and produced a "missing" novel. The program was brainless, it just built a complex mathematical model of Dostoyevsky's corpus and filled out a bit of asymmetry in it. I'd have expected such things, when they appear in reality, start with text... but apparently synthesizing text requires more brains than images, or it is easier to fool a human with an image than with text. And the recent surge of "AI" stuff is still mucking around with very primitive models, and no closer to actual intelligence than it had been before the field stagnated. I'm trying hard not to judge it too harshly - it doesn't lack qualities in itself, and the process is impressively futuristic - but I can't shake off a feeling of falseness about it, which might be less if the video hadn't been so... melodramatic. I agree with Rich and his 'reproductive cloning' comment. They fed in all the tiniest details of Rembrandt's 'caucasian men in hats and dark clothes, facing right' and they got out a caucasian man in a hat and dark clothes facing right, that looks fairly like a Rembrandt. I'd have been disappointed if they hadn't. And in the face of this they call the piece 'the new Rembrandt', which is the main source of my grumpiness here. It may be distortion of the image or just me but the right hand eye seems placed incorrectly (too far over) and the perspective seems off, as if the eye has been turned towards a more frontal view. soulless and wooden. end of. So how long do we have before we, and in particular the experts, cannot tell the difference. The computer's "painting" is not the painter's painting. The painter creates. The computer "creates" from what the painter created. Big difference. In essence, a form of copying. Nothing more. But interesting. Arts & Sciences with the critical operative being "&". Seems lifeless, without soul. Other than that, yes, on first looks, it looks like a Rembrandt. Just without the soul of the painter, and without the soul of the sitter/person. Interesting use of technology, and I am certainly no art expert at all, but the painting looked to me like an average. An average across all parameters - colors, texture, pose, features - that ironed out emotions completely. Obviously a heap more science than art visible in the end result. Well it looks incredible to me. It really does look like Rembrandt painted it, and with the three dimensional surface it really does look like an original hand painted oil painting. But the question is, what do these scientists wish to achieve? Do they want professional artists to be replaced by computers and 3D printers? Do they want representational art to not be a viable form of making a living for anyone anymore? Maybe they do. It's the same thing with self check-out machines replacing cashiers and the whole robotic revolution going on where all the jobs are slowly being replaced by computers and machines. Maybe art and illustration will be completely replaced by computers in the future also. Maybe in the future no one will have a job anymore and everyone will just get a living wage and pursue their interests for their own enjoyment and not for financial reasons anymore. And Terry, yeah it is amusing to have to click "I'm not a robot" to post a message here. But in the future, job applications might require that the button "I am a robot" be clicked. Ha ha. With all their poetic gushing about wonders of technology and buzzwords like "deep learning", the process appears to be automated collage with distortion built-in. Like much of the modern AI hype is, this is another fake. "I find that quite impressive, but thankfully not perfect." It's absolutely incredible to me how low people are prepared to set their expectations when it comes to computers doing anything remotely creative. "The project has involved data scientists, developers, engineers and art historians. The final 3D printed painting consists of more than 148 million pixels and is based on 168,263 Rembrandt painting fragments. A facial recognition algorithm was then used"
That's a lot of effort and resources and human input for a piss-poor result. And every week we have articles about AI and how robots are going to replace the workforce on a grand scale. And people lap this stuff up. Even though the best translation software is a joke when it comes to any complexity of thought. Even though the most advanced robots have all the dexterity of an arthritic pony. And even when presented with results like these that not even a fourth-rate forger would be proud of, people nod and say "It's actually quite impressive, you know." Raise your standards. 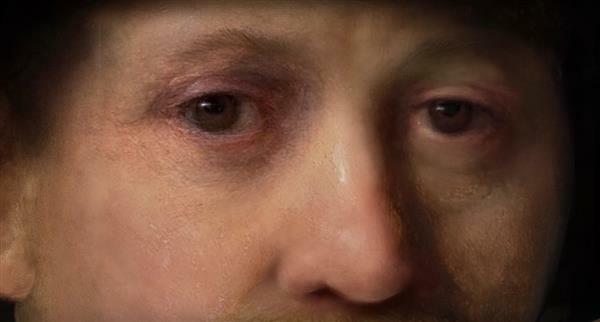 Interesting to collect all that data, but the only way it looks like a Rembrandt is a quick glance. I'm not surprised at the soulless lack of energy, but I am surprised they missed the texture and the emerging from shadows. It seems like that would be possible to duplicate with a computer. Was the computer looking at a human being when it 'printed' this? Was it printed in luscious oil paint? No? ... then, pastiche! Had I not known a computer had constructed this painting, from across the room I would have been impressed with the skill of the artist generally and excited thinking that I was experiencing a Rembrandt due to the fact that he had a recognizable voice. It is not surprising that most who commented experienced the article negatively due to the implication that painters might no longer be needed. But I found an article that articulates, for me, the difference between computer-generated art and human-generated art. This is a very passionate response with an outstanding lament: "To think this most human of artists can be replicated digitally is a truly bizarre notion. The really sad thing is that anyone would want to do so." ...Late to the party with this reply, but... frustrated. I wonder how much this cost in terms of labor/hours and equipment to produce a reasonable facsimile of a boring and static Rembrandt-like ‘painting’? If they printed two prints, they could cut that cost in half! For a first attempt I suppose its ‘pretty-good’, or maybe ‘not bad,’ or at least ‘competent’; but nothing a good portrait painter and copyist couldn’t knock out. They probably could have gotten a better result by including that ‘good portrait painter and copyist’ on their team of scientists, technicians, and art-historians. That ‘60 point facial-proportion algorhythm’ is pretty kool, though. This was a first attempt! I wonder how it will progress. Rich's comment about having your portrait done by "Rembrandt" someday seems quite likely to me. Leave it to Microsoft to try and copy an original.